It comes as no surprise that almost every industry in today’s society can benefit from SEO. The fact of the matter is: the internet has become a crucial part of everyday life and has turned the advertising industry upside-down. With the notion that everyone is technically connected to everything, making sure people decide to partake in your service really does come down to your internet presence. This is where Search Engine Optimization comes in, adapting your content to better suit Google’s search algorithms and making sure it comes out on top. Local businesses like repairmen and renovators aren’t the first bunch you’d put on the SEO train, but here we are. By going global and popping among the first businesses in the area, small local businesses can flourish and expand their clientele substantially. On the other hand, there’s local SEO. By going local, business owners can target the local market specifically, focusing on prominence in the area they operate in to make a name for themselves and enable future expansion. Whichever direction people opt for, the visibility that comes with an optimized web page cannot be ignored. This goes without saying, but businesses that focus primarily on online trade have to invest in SEO. It is one thing to have a nice landing page for clients, basing your complete business model on that singular page is a whole new ball game. If your page isn’t among the top 10 search results for the service offered, you might as well not exist. Optimization makes online businesses like AliExpress or DealsExtreme be the first ones to pop up when searching their respective fields and subtly ushers people into their user list. Opening up a clinic or a private practice and forgoing a lifetime spent in crocs is anything but easy. The worst part about all of this is the constant pressure of finding regular patients to keep the practice going. One of the first things people look up when they move into a new area is local businesses, including local clinics. Seeing as how most people’s best bet is going to be Google, SEO instructions given on their site start to sound like a godsend. And this godsend will ensure that people will opt for you as opposed to your competitors. Let’s face it, we all do it. Hungry on a work night with no idea what to go for, so we turn to Google. This is precisely why restaurants need to step up their game. Whichever cuisine is on the menu, keep in mind that there will always be someone searching for it. Be it quiche or miso chicken ramen, the demand for food will always be there. By improving visibility, the restaurant is not only gaining customers but possibly incentivizing positive reviews on Google or secondary sites like Yelp; and let’s face it, everyone loves a 5-star review. That being said, a detailed SEO campaign will not only provide more visibility to your restaurant but, as you can see, it might also produce more reviews. If you’re the lucky owner of a business with offices in multiple locations, you know that you have it is essential that each of them can be easily found by your customers. The biggest help, in this case, is an SEO campaign covering each of your locations in local search. This will ensure that your customers will be directed to the nearest location. Let’s say that you have specific deals at certain stores; if you optimize locally for them, there is a greater chance that you will attract people looking for those products in that specific area. With the rise of business cleaning options, competition has become fierce, with companies literally clawing away at the opportunity to put your junk in its rightful place. With so much competition, businesses like Cleanworks have had to step up their game in Gold Coast. This is a prime example of what SEO optimization can do, their visibility skyrocketed and, more importantly, helped build brand recognition. Brand recognition is paramount to any business as it makes your company name recognizable, and if it’s something people recognize, it’s going to be something they’re going to use. We’ve heard it a million times when real estate is concerned; it’s always one thing: location, location, location. However, when it comes to the realtors themselves, it’s more likely to be: SEO, SEO, SEO. What’s even more important in this case is local SEO, local SE… Well, you get the gist. The fact of the matter is that an agent can have the best deals and plots in the county if no one ever sees them, he’s not going to get far. With people searching specific towns, home designs, and even blueprints, making sure your ads are the first they see will make the difference between making a sale and going home empty-handed. Investing in a precisely targeted SEO campaign can bring you more traffic than expected if it is expertly done, and thus, it might even improve your sales percentage. By now you’ve probably guessed it. Literally, any industry can benefit from rubbing Google’s algorithm the right way, some industries more than others. For better or for worse, Google has its fingers everywhere, but at least we’ve been given a cheat sheet to play the system and come out ahead. Marketing has seen a massive shift in recent years, with less and less being spent on classic ads and more on keywords and site formatting. While these industries might have higher stakes, for the time being, rest assured that all the others will soon follow suit. Could the Gold Confiscation of 1933 Happen Today? Chloe Smith is a cycling enthusiast, business consultant for Supercheap storage solutions in Melbourne and a part-time writer always willing to share tidbits of advice. She believes that passion, courage and, above all, knowledge breed success. I see first hand how having your SEO game just a bit in order grows your online business. Readers and clients and customers sometimes find me through Google, and I place little emphasis on SEO, really. I help people, create thorough content and do my fair share of guest posting to drive some search traffic. Neat how it works. Gald that you liked Chloe’e post. 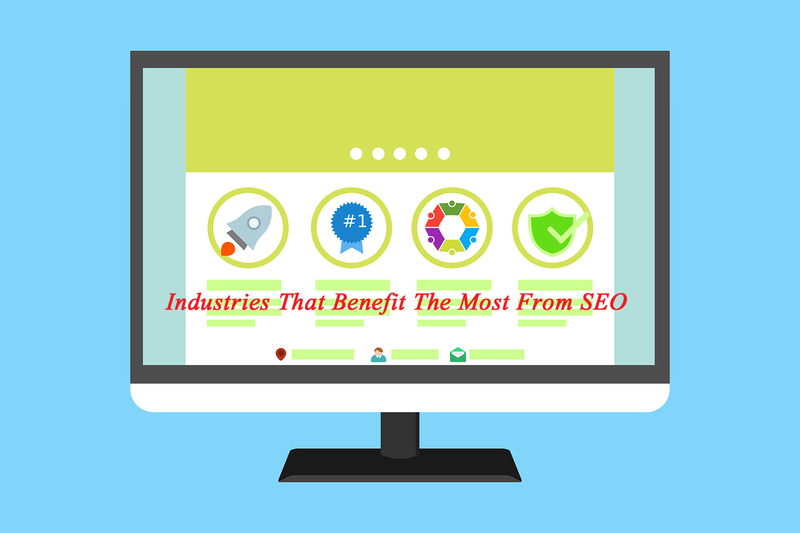 Definitely, the above 6 industries can give great benefits from SEO but that is not easy. Restaurant, Hotels and Real Estate on the top industries which takes a lot of investment, time and of course experience. Recently I read the article on the web that there are 1.6 million bloggers available but blogging is still a great source of income and gives great benefits from SEO. What do you think, please share your experience? I have gone through by your article and found that it is very informative and useful. Keep it. Thank you, A K glad you’ve found it useful! I don’t use it so much for myself, I just rely on my Yoast plugin 🙂 But when it comes to working with those who are off line businesses, this article gave me so much confidence. I have done a tiny bit of customers who are off line businesses. I do have to rely heavily on SEO. So far it has helped tremendously when it comes to the local dress shop and the local restaurant who has so many competitors. I SEO everything from articles, to images. Thanks so much….I was second guessing myself and now I know all my study of SEO is working. Very helpful article and bookmark-worthy 🙂 Keep on sharing. Of all the 6 industry you listed, real estate is something we have yet to try, curious on how to apply SEO for this industry.